Involving our hearts in Collaborative Practice is not just a metaphor. The organ that pumps our blood, also contributes to our thoughts. 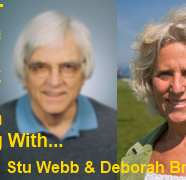 Check out what Stu Webb and Deborah Brakeley had to say about actively involving our actual hearts. Work that they’ve been sharing for several years at the IACP Forum along with Peggy Thompson and Jennifer Tull, who were not able to join us for this conversation. This heart work makes for interesting companion thoughts as research also tells us more about the brain. See my interview with Pauline Tesler for those advances. You know, to be truthful, authentic Collaborative work requires working from our authentic selves. Why? The disclaimer provision (the requirement of withdrawal from representation if settlement fails) takes away the efficacy of litigious aspects of the legal process with all its manipulative moves. posturing, distortion of fact, working to perform to achieve a specific result, etc.. None of these tactics are appropriate for collaborative work. So what is left? What’s left is learning to practice from WHO YOU ARE. We call this the paradigm shift. If you open yourself to this “letting go”, you’ll find you’ll be making the process more productive for you and all participants. Now I’ll share with you that this letting go opens yourself to what I sometimes call your higher self or spiritual side. Don’t get me wrong, this approach may take some work—old habits die-hard. But don’t make it harder than it is. In many ways it’s what’s naturally left when you let go of or drop off the old ways—your SELF remains. Let’s take the mystery out of the :”S” word. Many of us conjure mental images of solemn, esoteric religious practices when we think of spirituality. “Spirituality” is simply “the release of the qualities of the human spirit.” Isn’t that great! Spirituality shows up when we are in a state of consciousness where the natural qualities of our human spirit (or Self) are naturally available to us. Some of these innate qualities are compassion, patience, tolerance, contentment, loving-kindness, not to mention clear insight, access to common sense and appropriate humor. Furthermore. these spiritual qualities cannot readily be accessed from lower states. That is, it is doubtful whether you can, for example, become compassionate by trying to become so from a lower state. All our thoughts in the lower states are centered on supporting our performance-ego entity. In the higher states, our thoughts quiet down and the ego-sense is dampened. We’re in a feeling tone of being! 1. Everyone is seeing the issues and problems from a higher level. It’s like looking down on a maze from fifty feet up—you can see which way to go to avoid the obstacles. 2. Compassion and forgiveness begin to show up, which helps bond the team. 3. It’s catching! If the collaborative practitioners can be centered in their higher state, this goes a long way toward modeling this state for the clients. 1. Find a way to drop your thoughts, Thought mainly comes from the head. Higher consciousness comes from the heart and a warm bodily felling. 6. Learn to pay attention to the signs that you’re thinking or bodily tension has once again taken over. (It happens all the time: Practice, Practice, and Practice.) Noticing it allows you to do what you need to do to return to the spiritual state. A. Institute a meditation or mindfulness program, that in the long run will go a long way to enabling you to quiet your mind and make it easier to get in touch with your authentic self. B. For some, the internal direction to yourself to “Become More Centered” is enough to reorient you in the higher state. CAVEAT: No technique is ultimately necessary to move from a lower to higher state because the higher state is your true one. With practice with the shift, moving to and experiencing it—could be as effortless as moving your hand from your knee to your nose. While litigators go to seminars to perfect their trial practice, settlement (read collaborative) practitioners need to home in on their settlement skills to practice being whom they truly are.